Riverside Theatre battled home to outdo last year’s winner Albertas Run and give his trainer Nicky Henderson a staggering sixth victory at this year’s Cheltenham Festival in the Ryanair Chase. Henderson was quick to pay tribute to the ride given to the winner by his stable jockey Barry Geraghty, saying: “He never got into his rhythm and was never jumping but that was one of the greatest rides I’ve ever seen. And the horse is as tough as they get. He will try for you. He just probably needs a bit further. We’ll have to go up in trip. “They are always going to go a good gallop in these races and it was just a bit out of his comfort zone. His jumping wasn’t standing up to the pace of the race. “He was just having to fight his way round and it was uncomfortable to watch - I should think it was uncomfortable to ride. 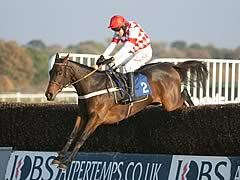 The trainer added: “I was watching it with Jimmy [Nesbitt, owner] and we were all doom and gloom but you just can’t say enough about the ride Barry’s given him. Actor Jimmy Nesbitt admitted that he “was lost for words” after Riverside Theatre prevailed in one of the most exciting finishes at this year’s Festival when landing the Ryanair Chase. “It’s just extraordinary,” said Nesbitt. “Nothing really prepared me for that, I’m rarely lost for words but I’m very emotional now. This is the greatest sport in the world and I think racing is sometimes a bit hard on itself, there are tens of thousands of people here today enjoying themselves. “The horse was beaten at the last and then Barry asked him for a bit more. He was brave and he was strong. “I was away in New Zealand when Cheltenham was on last year and I felt I was in a hinterland trying to watch it from out there. The horse then had an injury and it was a remarkable performance from Nicky (Henderson) to get him back to Ascot last time. I was lucky enough to be there and I was nervous beforehand but he won comfortably. Nicky is the loveliest man you could meet and did such an incredible job bringing the horse back. “The training performance at Ascot was extraordinary, but to have him in that nick today and the courage the horse showed there was incredible. We knew he would stay and we knew he would jump but to have had that brilliant battle, I can not believe it. After some armchair rides earlier in the week, Barry Geraghty had to dig deep for victory in Riverside Theatre in the Ryanair Chase. “All wins here are sweet,” said the Irishman, “but some you have to work harder for than others. This horse was beaten everywhere but the line. He hardly jumped a fence, he was never travelling. But every time I got into him and asked him for a bit more, he found it and gave it to me. He is just so game. “It’s been an unbelievable training performance to bring him back to win after a year off [at Ascot in February] and then come again and win at this level. But having a trainer of Nicky Henderson’s skill behind you, you know that when you get stuck into a horse at the business end there’ll be something there, and so you can do it. “All the way round, I thought I’d no chance, he was never travelling well enough to hold his position when others came around him. I threw him at the third last, I thought I’d still no chance. Second last, still no chance. Last, still no chance. But you never give up trying here, and nor did he. Trainers Jonjo O’Neill, Alan King and Philip Hobbs had reasons to be cheerful after horses they train finished in the money for the Ryanair Chase. The O’Neill-trained Albertas Run, bidding for his fourth Festival success, was just half a length behind winner Riverside Theatre, and a mere half a length ahead of third-placed Medermit from King’s yard. It was five lengths back to Hobbs’s Captain Chris, but his effort was a huge improvement on his previous outing when pulled up in the Argento Chase at Cheltenham.